Dawn Madison is the kind of heroine that Hollywood can't get enough of at the moment. She's tough, cynical, over-sexed and of the minute. But in Night Rising Dawn rejects the life of her movie-star mother, Eva Claremont, in favour of the unglamorous role of a stuntwoman. 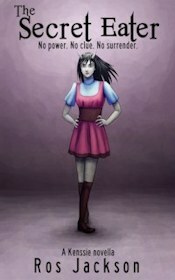 Eva died when Dawn was very young, and Dawn tries hard to avoid any comparisons between her mother and herself. When Dawn's father goes missing the trail leads her to Limpet and Associates, a private investigation agency. They are an odd bunch: a psychic dwarf called Kiko, the geeky Breisi, and a boss who never shows his face. The agency wind up hiring Dawn to look into the strange reappearance of Robby Pennybaker, a child star who supposedly died of an overdose 23 years ago. Robby has turned up in a contemporary movie, but he has not aged a day. Dawn's investigations plunge her into the dangerous world of vampires, and bring her under attack by creatures who can hypnotise and enslave a person with a mere look. This setting may seem somehow familiar. The concept of a paranormal detective agency staffed by oddball characters with possible paranormal powers is very similar to Joss Whedon's Angel, and even the snappy dialogue saturated with references to pop culture is over-familiar. The vampires themselves are, for the most part, more or less your standard Buffy and Angel-issue bloodsuckers without souls, rather than the more unique creations you might find in the books of Anne Rice or Barb and J. C. Hendee. However, the lack of a soul doesn't seem to make much difference to these undead. They still make love, show compassion, and crave attention in much the same way that they did when they were alive. And although a lot of them seem to be insufferably vain, some of the vampires are even rather likeable. All of this muddies the waters on a plot that is already quite complex. Dawn has her doubts that she is doing the right thing, and these are reinforced when Matthew Lonigan comes on the scene. He's a rival P.I. who warns Dawn to beware of her mysterious new boss. 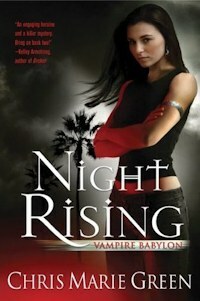 Night Rising does have a few scenes that risk cliché, but on the whole its punchy, modern dialogue lifts it above the level of just another generic vampire novel. It also boasts one of the most bizarre seduction scenes ever committed to paper. This is a very racy novel, with Dawn having to do battle with her own hormones as often as she has to fight with the undead. The plot charges ahead like an over-caffeinated action hero, and whilst it's an enjoyable ride it's often a ride in the dark. There are plenty of mysteries that arise, apart from the central puzzle of the Pennybaker case, and Night Rising is a book that starts far more than can reasonably be resolved within its pages. So the ending does leave you hanging to some extent. Fortunately the characters of this book do turn out to be more rounded than their setting would suggest, and Chris Marie Green gives us enough good reasons to want to come back and delve further into Dawn Madison's weird, high-octane world. A series of murders threaten the fragile peace between vampires, mages, and the other dark races. The fourth in the Sabina Kane series. A woman who raises zombies is asked to investigate a serial killer who targets bloodsuckers. The first Anita Blake book. How can Anita Blake defeat the Mother of All Darkness, an ancient vampire with no body of her own?